Dogs' paws have to cope with daily wear due to various seasonal hazards, including ice and grit in winter, and hot asphalt/pavement in summer. This is a major strain on the paws. In addition to normal wear and tear, this can cause paw pads to become dry, rough and chapped. These Outdoor All Road Boots, designed by All For Paws, provide protection for your dog's paws. These dog shoes are specially designed for the outdoors and have a Velcro fastening for easy removal. 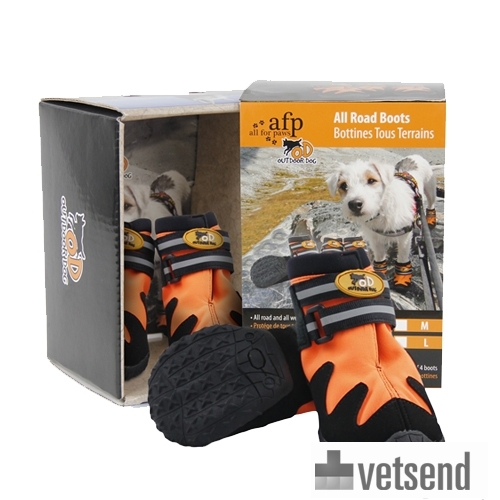 Velcro also ensures that the boots fit the dog's paws snugly so they remain in place. In addition, the AFP Outdoor All Road Boots feature a sturdy rubber sole. The reflectors on the shoes ensure that your dog is highly visible in the dark. What if the AFP Outdoor All Road Boots do not fit? The boots can be removed from the packaging and held up next to the dog in order to check whether they fit. For hygiene reasons, the boots cannot be returned if they have come into contact with your pet. If we find that the returned product is stained, worn, contains animal hair, smells or has been washed after use, we cannot return the product to you. In this event, it will be donated to a charity (local shelter). As we are often confronted with products that are returned in a less than new condition, we have to apply these rules for fitting and/or returning products. Have you used AFP Outdoor All Road Boots before? Let us know what you think about this product.